If you missed part one of this tour click HERE. Now we will move on with some shots of my sister's family room, kitchen and dining room which have all had changes made since the last time I shared her home. Let's start in the room they spend the most time in. Love this new blue table. This clock was her birthday present to herself. She bought this light in the hardware department at Walmart for a few bucks and added it over this armoire. Love the industrial look mixed in. I love her vignette on her coffee table. Great display on the mantel. Just a couple of dining room shots. She painted the gold finished mirror white. And last up is the kitchen. She painted this side of the cabinets red and removed the doors. Love it. She found this wonderful rusty, chippy basket at a consignment store. Love this idea for keeping soaps, washcloths and lotion close at hand. Son's leggos are on the table. Just part of everyday life. I hope you enjoyed the tour. I am sure it will change again soon. Of course the holidays are coming and I can share her holiday decor with you. I just got home from being out of town all weekend and have not been good about visiting your blogs. I will be better soon, I promise. I love house tours. I can't wait til the holidays and seeing everyone's beautiful homes. Love that blue table and that blue lamp and the clip light. I've been thinking about using those lights as spot lights too but was afraid they'd be too casual for my home but it looks great in her home. So I think I'll try it. Thanks for the inspiration. Kim, her house is just beautiful!! 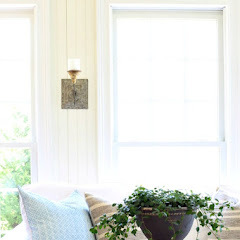 I noticed the dark paint on the french doors and was curious about her window trim. Is it white?? I really want to paint my french doors black, but my windows have white trim. Love the legos of course! Kim, Thanks for the tour of your sister's gorgeous home. Everything is just beautiful. I see lots of things she can send to me if she gets tired of them! You and your sister's styles are very similar and both of you are talented through and through. I have that white ceramic rooster like hers and have used it for many years. Kim, I really enjoyed the tour of your sister's home. I see similarities in your styles. Anyway we could see more of what I am guessing is the breakfast room? I love the green and black combo. Thanks for sharing. Such a pretty home! I love the touches of blue she has added. And that mirror - OK, I'm painting mine white now, too! Tell your sister thank you for the wonderful tour! I love the red cupboards!! Very striking! What a truly lovely home. Someone has a knack for decorating!! Your sister's home is just gorgeous!! Stunning to say the least! My favourite part? The legos on the table !! Boy I can relate to this and it just says to me ...we live in our home! Thank your Sister for sharing her pretty home with us. Wowee! I seriously adore every square inch of her gorgeous home Kim. Thank you for showing us. The dining room is fabulous! Love the red paint and the mirror and the lamps. Can you tell I love it? Very nice, Kim. I am loving her kitchen! Love your sisters house! It is absolutely gorgeous! Decorating is obviously in the genes! I love her house and all her colors. I've been decoupaging. I'll have it ready for your party. Your sister's home is beautiful! Love a lot of her pieces. I love your sisters style. Thanks for letting us have another peek into her world. Its lovely in so many ways and very unique, which I love.. This gal is a Leader and that makes me smile..
You two need to go into business. Seriously... So pretty! Tell your sister her home is beautiful! I enjoyed each photo and loved her birthday present to herself!! Who taught you and your sister your great sense of style? You both have absolutely beautiful homes! Wendy, actually my mom and dad both have good taste and I guess we got the genes from them. Plus we love to look at design books and magazines and go to home tours. 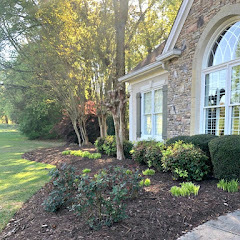 Kim, Thanks so much for sharing your sisiter's beautiful home! Love what she did with the mirror and the cabinets. Love your sister's home, just beautiful! I can't wait to see holiday pictures of her home! I can tell you are from the same gene pool Kim. You seem to have very similar taste. Love her special touches. I enjoyed the tour! Your sis has a unique style with lots of inspirational ideas (same as you!) Now how about your mother, will we get a tour of her home as well? Hope so! Thank you for sharing this beautiful home with us! I missed part 1 and had to go take a look! So glad I did! I love her style. All her accessories, colors, etc...Loved it! Thank her for sharing her home with us. I loved everything. The white mirror on the intense wall is just gorgeous. I have an old mirror very similar that I have thought of painting a black. It was inspiring to see it done. I love her open cabinet too. Tell her it is wonderful. What a beautiful home! Thanks for sharing (and thank your sister, too). I get so many great ideas from your site. So glad I decided to follow. You have become a favorite. Kim, your sisters home is beautiful. Your mom must have been a great inspiration to you two! Enjoyed peeking throughout your sister's home. It is beautiful! Hi Kim, Thanks for visiting. Like you my plans were to decorate after Thanksgiving for Christmas, but a girl has to do what she has to do. I can't get enough of looking at that clock in your sisiter's house and that blue lamp. So much character in both pieces. Love it! So glad to see part two. I am just drooling over all her wonderful willow baskets. I just can't help myself. I really, really, love and want that wicker cake plate w/lid though. She has such great style! Please thank her for allowing you to share this with us. Beautiful, I love her style. Thanks for sharing. Your sisters home is so beautiful with so many wonderful details. You both are so talented. The industrial light over the cabinet is a great idea. oh, so comfy and cozy! Love the pillows and that sea blue lamp! Love this Kim. I've truly enjoyed seeing your sister's home and hope to see more! Thanks for sharing the house tour! 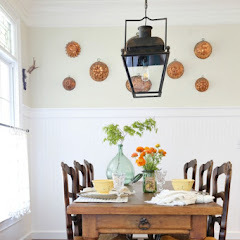 Her home is so pretty and there are so many great ideas. I really need to find a wire basket like that for above my fridge too. Your photos are lovely and I love all the vignettes. 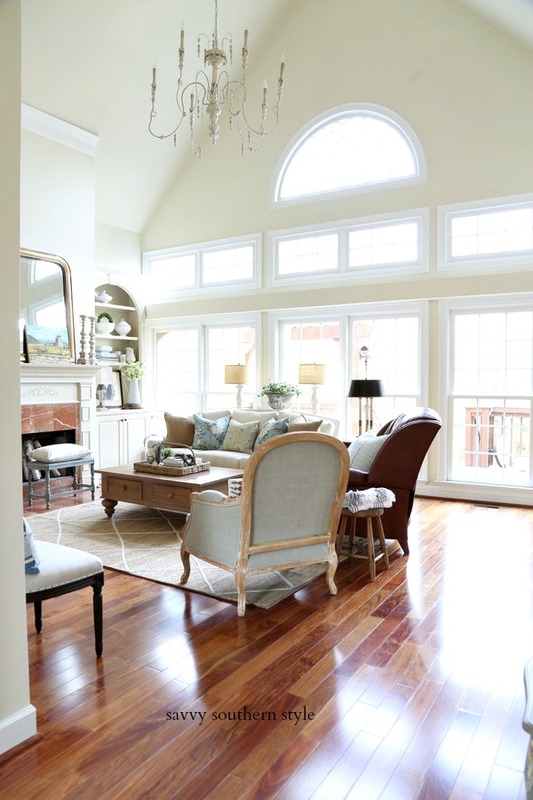 Do you have an wide view of the family room? I would love to see how that large armoire/hutch relates to the sofa area as I'm considering doing one for our livingroom. I love the coffee table - what a neat idea to add the light on the armoire. But, my favorite - the red kitchen cabinets and the white dishes. :) Thanks for sharing and tell your sister it is all very pretty. Thanks for the tour... what a fabulously decorated home. 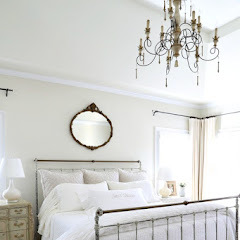 I really love the wall clock and the dining room mirror she painted white. I love looking at houses so much. Thanks for sharing your sisters with us. I got behind on blogs this weekend too & now I'm playing catch up. How pretty! My favorite is the red painted kitchen cabinet with all the white displayed! I'm guessing your mother liked to decorate! Thank you for sharing your sister's beautiful touch! Kim, like you, your sister has a gorgeous home! I love her wonderful sense of style and your photos are wonderful! Obviously good taste runs in your family! 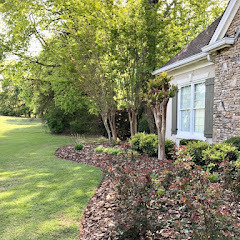 This is a beautiful home and I got some great ideas from these photos!